Innovation and imagination save the day in 'Lost Iguana,' a spot for HP directed by Simon McQuoid of Imperial Woodpecker in collaboration with 180LA and The Mill. 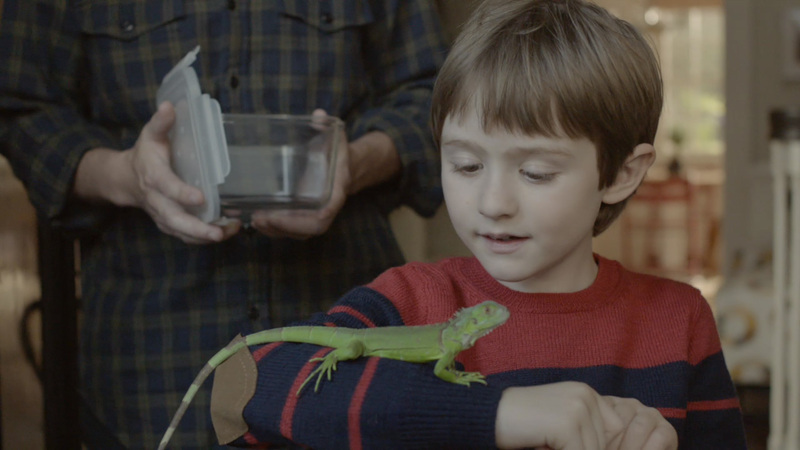 When Ralph the pet iguana goes missing, his young owner uses a little creativity and the power of HP to bring him home. Thanks to the efforts of a tireless search party and their perfectly placed media, including digital billboards on LED screens, Ralph is eventually returned safe and sound. 2D lead artist Andy Dill and 2D artist Jason Bergman were faced with integrating the LED screens into the overall environment. Bergman comments: "I think our biggest challenge was definitely creating the LED screens on the buildings in the night shots. We needed to create a photo real environment that gets flooded with light from the screens. This required us to manually relight the shots, including reflections in cars and buildings, to create a comprehensive scene. It's really fun to be able to take the time to work in the fine details of a scene like that. Most people are less likely to notice some of the individual touches, but when they view the shot as a whole, those are the details that make it believable." On Bergman's skilled contribution to the spot, Dill adds: "Little details like that make me happy. Full disclosure: I tried to talk Jason out of the car reflections because I thought they'd take too long to make look nice. He did it in about 20 minutes."